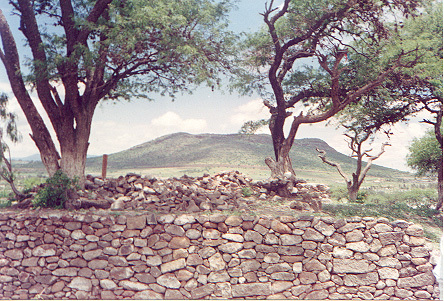 This archaeological zone is located next to the San Juan river, in the south of the city of San Juan del Río, in the central state of Querétaro. Great part of the vestiges of the pre-Hispanic establishment now is under the streets and houses of the district de la Cruz. 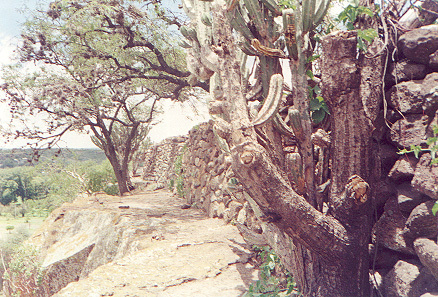 Nevertheless, the vestiges located in the Top of the hill of "la Cruz" have practically stayed intact, except for the ones that could have been in the North sector of the hill, that was cut for the construction of the Mexico-Quere'taro freeway. 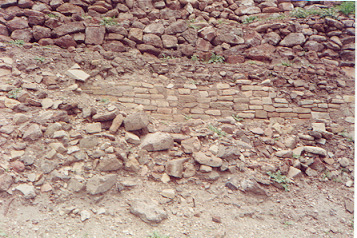 The archaeological zone had been recognized by the historian Rafael Ayala Echávarri, who contributed with important data on the archaeological zone and he spread them in his book: "San Juan del Río, Geography and History"; published in 1971. In first half of the Sixties, the first systematic archaeological recognitions as a part of a project were made. The name of the project was "U.A. 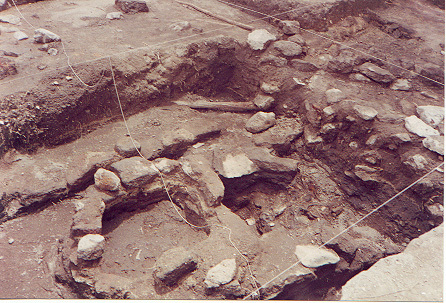 San Juan del Río" of the National School of Anthropology and History, coordinated by the archaeologist Enrique Nalda and the results of the Investigation were displayed in 1975 in the thesis of the mentioned archaeologist. 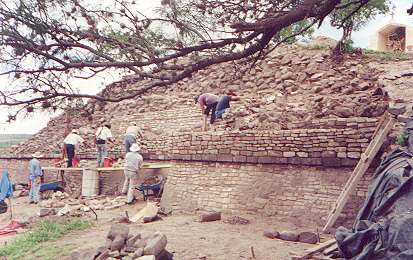 Later, in 1986, works of archaeological rescue were made coordinated by the archaeologist Juan Carlos Saint-Charles in the zone and in 1991 the same investigator and the archaeologist Ana Maria Crespo coordinated a new intervention on the part of center INAH Querétaro. 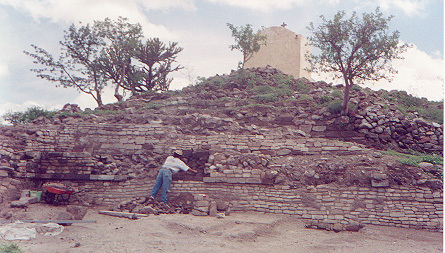 The information recovered in these work has been published in magazines of the Independent University of Querétaro and in different publications from the National Institute of Anthropology and History. This site is one of most important in the state of Querétaro by its long history of occupation that goes from 500 Before Christ to 900/1000 years After Christ., throughout which had as much changes of population as in the architectonic patterns of establishment. Of this long occupation three main stages have been distinguished: the first stage from 500 Before Christ to 100 After Christ. In this lapse groups settled down in "La Cruz", surely they came from the southwest of the actual state of Guanajuato and we identified them with the culture of "Chupícuaro". 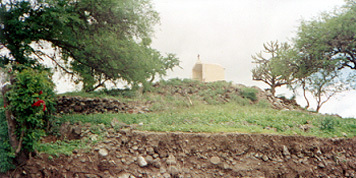 These groups occupied the top of the hill of "la Cruz", where a ceremonial center was constructed, that counted on small quadrangular platforms of land and mud confronted with tufa; surely also there were constructions made of wood and other materials, of which foundations of circular form have been located. In the skirts of the hill and the left margin of the San Juan River stepped terraces were constructed that were used for room and culture. The bony rest corresponding to this one time, indicate that the inhabitants practiced the craneal deformation and the dental mutilation. The second stage of occupation considers between 100 years After Christ and 700 After Christ. In the beginnings of this stage groups of the River basin of Mexico arrived at the region. They also chose the Hill of la Cruz for their establishment, construction sites were made that changed the aspect of the old ceremonial center: a great platform that covers all the surface of the hill was constructed, and in the northeast sector it was built a piramidal plinth and an open seat forehead to the facade the west of the same one. Towards 450 After Christ it had been created, apparently by teotihuacanos groups, a great center of power in "El Rosario", seven kilometers to the northeast of the hill de la Cruz. "La Cruz" continued with his character of ceremonial center, but it lost his original relevance. The stage between 900 years and 700 After Christ is of great movements of groups and sprouting of new establishments in a large extent of Mesoamérica. Many centers of the previous time were left, nevertheless, along the San Juan River were generated new establishments, mainly in zones of ravines, although some previous centers of population were recovered. It is the case of the hill of la Cruz, who in architectonic terms does not denote great changes, but a great constructive activity, mainly towards the west of the hill, where staggered seats were constructed, that now are under the small village of the district. The inhabitants human interments in these seats, were accompanied by rich offerings of objects of mud and stone. Some of the buried individuals previously were dismantled. 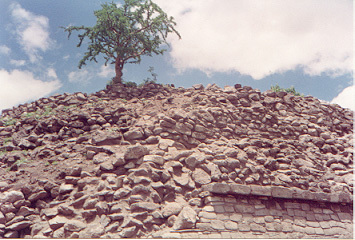 Some elements of offerings indicate some type of relations with groups of the area of Oaxaca and the high river basin of the Lerma River. The mesoamérica north was left by the agricultural groups at the beginning of the second millenium and these territories were occupied by hunting groups known known as chichimecas, until the arrival of the Spaniards. The San Juan River is possible to be considered for these moments as the border between these groups chichimecas and the agricultural groups located towards the south of this river.